This post is specially for those of you with problem skin, to me that’s basically all skin that isn’t well behaved. This includes acne prone skin as well as sensitive and any other type other than normal, healthy skin. Heal Gel essentially is a cure all sort of product that’s formulated to address any/all of the above problems. It’s for soothing, repairing and renewing skin so that your skin returns to a healthy state, fast. Before we head onto the review i’d like to leave you with a bit of back ground information on this wonderful product. Heal Gel was created by a team of plastic surgeons in collaboration with an award winning dermatological biochemist to address the need for an effective skincare range to help target everyday skin problems. Initially developed to help the healing process of post surgery, this is a wonderful potion to keep at home for ‘first aid’. Heal Gel contains natural ingredients such as Arnica, which helps with bruising and swelling, collagen boosting hexapeptides for renewing skin and also organic Silicone which acts as a protective barrier and also protects from scaring. Starting off the review with packaging. Heal Gel comes in a plastic pump bottle in a hygienic and easy to use design which keeps the product fresh and contamination free. The pump is protected by a transparent cap (which I have conveniently forgotten to photograph) that secures the pump from unwelcome leakage by any accidental pressing. Flipping the bottle over there’s a clear strip where you can see just how much product is left (mine is halfway through). A simple handy feature which I personally love as you always know when to replenish your supply! The dispenser is a very small one which enables you to access the smallest amount per application without any wastage. Heal Gel as the name suggests is a slightly thick water based gel. I usually apply a generous layer over whichever problem areas I have and this dries down to a slightly rubbery film very similar to the texture of peel off masks. 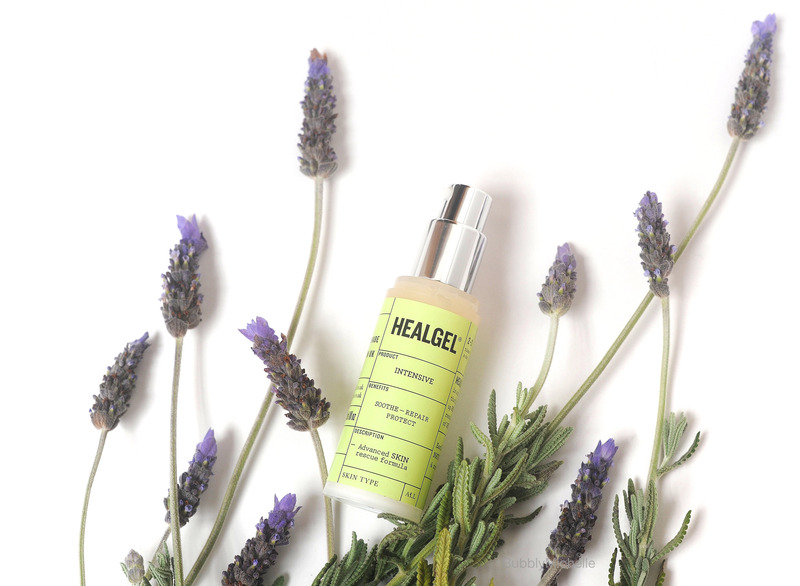 The gel has a refreshing, herby smell and delivers a soothing, slightly cooling effect when applied. This helps with calming down any irritation your skin might be experiencing. 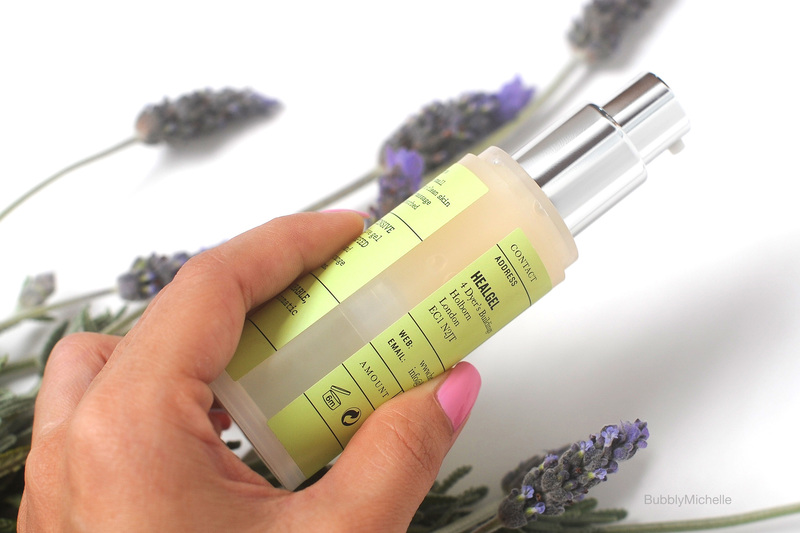 I use this for tackling a host of skin ailments from pimple scars to irritation & redness. Specially been loving this the last month as i’ve had a nasty, stubborn blemish that just didn’t seem to heal. Daily application at night helped repair the skin faster while minimising scarring. Another wonderful use for this product is to calming down any inflammation either due to a spell of acne or allergy. I apply it liberally over the entire region where I have any tingling, redness any other irritation such as inflamed follicles/bumps and it calms everything down over night. If you have persistent irritations from facial hair removal, again Heal Gel Intensive to the rescue. I use this on my entire brow area after plucking and also my upper lip when I pluck off any stray hairs (yes, the secrets out, cringe). In summery, you can use this as you would a first aid treatment such as a bad reaction to a facial, this is your saviour. You could also use this on minor cuts as well and it will heal them faster without bruising. This is a product that works regardless of skin type for quick & effective results, and I believe everyone should keep one at home for little emergencies where your skin needs a fast fix. It’s a product that works. For more good reads on this product you can check out these links. My favourite source is Caroline Hirons and Ruth from A Model Recommends. In fact it was this video that convinced me to purchase this last year! You can also check out this video while you are at it, with more information on Heal Gel Intensive as well as other goodies you might want to invest in. Other recent blog posts I found on this was by my favourite skincare blogger friend, Here. As always, her posts are reliable and informative. Ingredient list for those of you who are interested. I purchased mine from Space.NK when I was in London. I believe Net-A-Porter carries this now as well. Retail price is GBP 37.50 for a 30ml bottle. Also worth noting, this has an expiry date of 6 months from start of use. I have been sneakily using mine for close to 8 and it still works. But I plan on binning this soon and ordering a new one. Slight wastage of product as I have half left, but it’s something I don’t mind repurchasing. 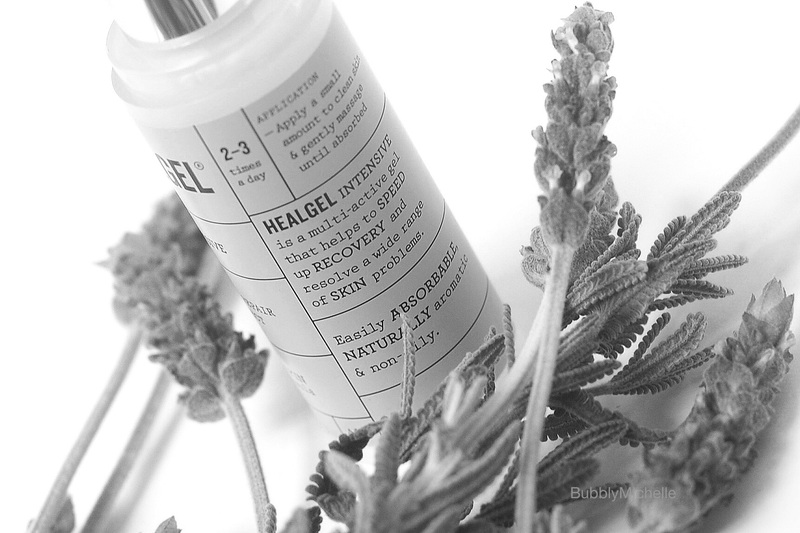 So happy to read a positive review on Heal Gel. This bottle is quite possibly one of my favourite products in my cupboard. I also have written about it on my blog. I use this exactly the way you have described spots, scars & redness/inflammation. I have also used it on other areas like my heel when it had a fight with a shopping trolley and a small burn on my hand. This stuff is worth every penny and while I don’t use it daily it’s something I will not be without for those little emergencies.